Chrysler has a long history of creating elegant cars that turn heads. The new Chrysler 300 is no different. This popular full-size luxury sedan has a modern look while still retaining the level of sophistication the line is known for. One trim level, the 300C, is equipped with eye-catching exterior elements. 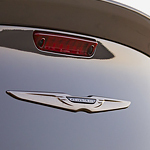 Some of the most notable accents on the body of the 300C is the chrome trim. Platinum chrome trim is used on the sides and front of the car. The grille is surrounded by the shiny material. In the center, you'll find the iconic Chrysler logo, clad in the same chrome finish. Chrome is also used on the door handles and side mirrors for added flair. The 300C also comes standard with different wheels. It's equipped with large, 20-inch wheels made out of polished aluminum. We here at Greenwood Auto are very excited to show you around the Chrysler 300 lineup.